Another month gone, and we’re edging ever closer to W-day. Not freaking out at all. Nope, not even a little bit. Anyway, enough of the scary wedding talk and more about what’s really important… the lipsticks. Yup, I need to plan these things out 7 months in advance. I’ve booked a makeup artist now, so things are getting pretty exciting. I haven’t had my proper trial yet, but I have a pretty good idea on what makeup I want. Lips wise, I want to wear Charlotte Tilbury lip cheat in pillow talk as a base and then the KVD liquid lipstick in Lovesick – the combination is really pretty, and lasts such a long time without smudging, fading or looking dry. Pretty much a winner. 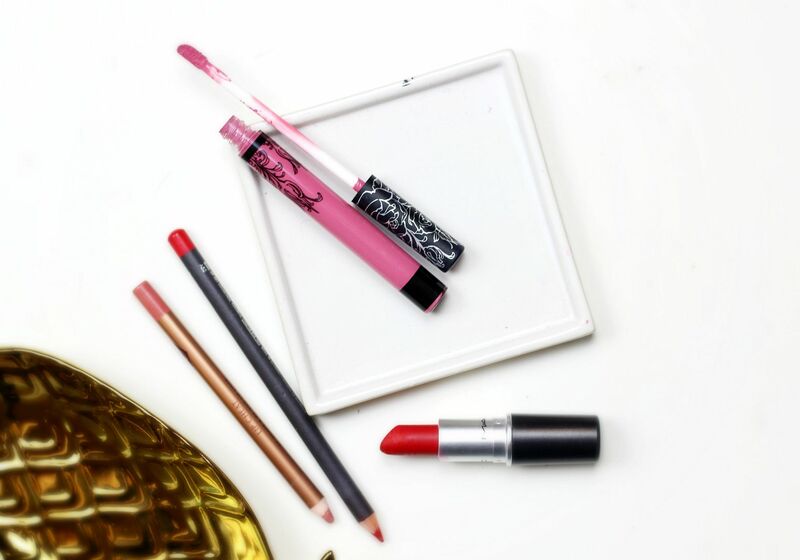 For the night I want to wear MAC Cherry liner with Ruby Woo lipstick – going for a 50s, classic sort of theme and Ruby Woo is just so perfect. I’d love to know – if you were getting married tomorrow, what lipstick would you wear? If you liked this post you might like this post on eight months to go or this post on nine months to go. Lipstick du Jour... round three.